Last fall, we began introducing you to the folks in our different departments – we have some new faces and some who you’ve known for many years. This month, meet the QBS Tax, Distribution and Reception Team. QBS helps relieve your administrative headaches by managing tax reporting for your business, including quarterly federal & state reports, as well as managing your unemployment program. Our Tax Department is responsible to file and pay all federal, state and local taxes for our clients and their employees across 49 states. We also assist the Payroll Department in setting up new taxes and rates whenever necessary. 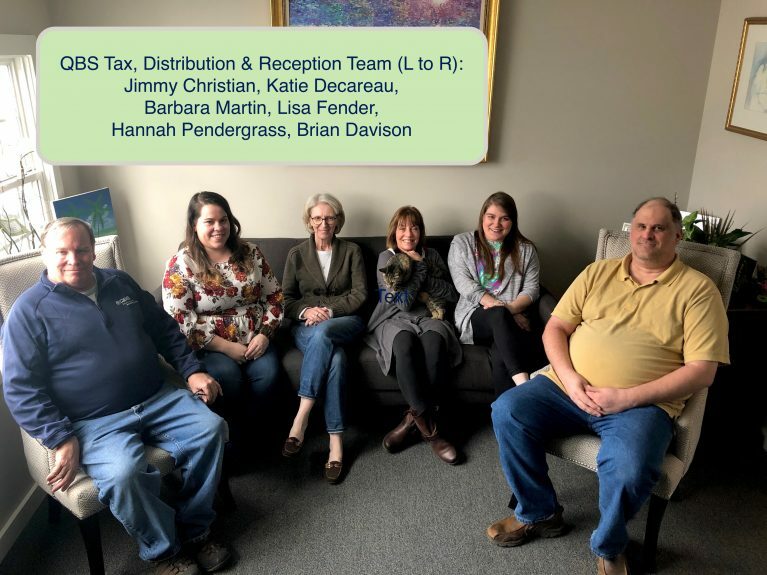 Our Distribution Department works very hard to process delivery for checks and pay cards, and depending on the week, we have additional part-time and seasonal employees who help us when we have a large number of items that need to be sent out. While many of our customers utilize direct deposit (ACH), oftentimes there is still a need for printed checks when new employees are hired. The Distribution team also works to ensure items are sent and delivered to the the correct locations as many times packages have special instructions. As is very common at QBS, our team members also work with other departments when needed – including helping the Benefits Department to reconcile and pay bills. Also pictured above, our QBS Receptionist job is very important as they are oftentimes the first point of contact and first impression that customers and their employees have when reaching out to QBS. Duties include distributing mail to QBS employees each day as it is received, taking care of all outgoing mail (ensuring that letters are properly metered, addressed, etc. ), answers the main phone line, and direct calls to the appropriate departments. Stay tuned over the next few months as we share more about other valued departments and all they do for us and our clients!